If Energy One America did all of their work in theaters or concert venues, the end of each project would result in a standing ovation. In reality, they do their work in some of the dirtiest, tightest, darkest places imaginable, and they still manage to earn standing ovations, if not literally, at least figuratively from their customers. 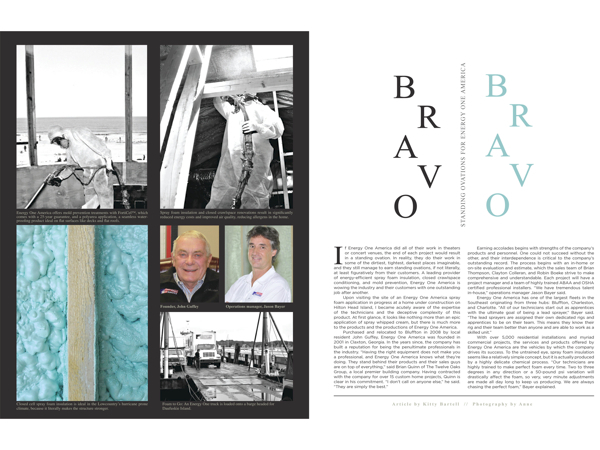 A leading provider of energy-efficient spray foam insulation, closed crawlspace conditioning, and mold prevention, Energy One America is wowing the industry and their customers with one outstanding job after another. Upon visiting the site of an Energy One America spray foam application in progress at a home under construction on Hilton Head Island, I became acutely aware of the expertise of the technicians and the deceptive complexity of this product. At first glance, it looks like nothing more than an epic application of spray whipped cream, but there is much more to the products and the productions of Energy One America. Earning accolades begins with strengths of the company’s products and personnel. One could not succeed without the other, and their interdependence is critical to the company’s outstanding record. The process begins with an in-home or on-site evaluation and estimate, which the sales team of Brian Thompson, Clayton Colleran, and Robin Boeke strive to make comprehensive and understandable. Each project will have a project manager and a team of highly trained ABAA and OSHA certified professional installers. “We have tremendous talent in-house,” operations manager Jason Bayer said. With over 5,000 residential installations and myriad commercial projects, the services and products offered by Energy One America are the vehicles by which the company drives its success. To the untrained eye, spray foam insulation seems like a relatively simple concept, but it is actually produced by a highly delicate chemical process. “Our technicians are highly trained to make perfect foam every time. Two to three degrees in any direction or a 50-pound psi variation will drastically affect the foam, so very, very minute adjustments are made all day long to keep us producing. We are always chasing the perfect foam,” Bayer explained. According to Colleran, who was a customer before joining the sales team a year ago, both open cell and closed cell spray foam insulation offer excellent insulating value and act as a good air barrier. However, closed cell insulation acts as a better moisture barrier and adds significantly to the strength of the structure. “In this area, closed cell insulation is used in crawl spaces, which helps protect wood floors from cupping and acts as an excellent sound barrier,” Colleran explained. Closed cell spray foam insulation is ideal in the Lowcountry’s hurricane prone climate, because it literally makes the structure stronger. “Closed cell foam is very rigid, so it is excellent for seismic activity and hurricane prone areas. Many architects and engineers will spec it into a structure and figure it into the design and engineering integrity of a building,” Bayer said. Spray foam insulation and closed crawlspace renovations result in significantly reduced energy costs and improved air quality, reducing allergens in the home. Both processes seal off areas of the home where mold and moisture breed. Research has established that spray foam insulation will reduce energy costs up to 40 percent, and closed crawlspace renovations will reduce energy use by 20 percent. Energy One America also offers mold prevention treatments with FortiCel™, which comes with a 25-year guarantee, and a polyurea application, a seamless waterproofing product ideal on flat surfaces like decks and flat roofs. In addition to traditional homes and business structures, Energy One America can work with almost any structure that can hold foam. Thinking of making your chickens more comfortable? Your coop can be treated. From gas stations to barns, there is an application for almost anything. According to Bayer, wine cellars are excellent candidates for their services. Any aficionado could tell you, maintaining the temperature of wine is critical to its care. As with all great shows, the audience is the true judge of a performance’s success, and Energy One America has nothing but admirers. Dr. Phil Miller of Augusta, Georgia purchased an income-producing property on Fripp Island and hired Energy One America to treat the home, which was in much need of renovation before it would be ready for renters. “We couldn’t get the temperature to even stay at 75 degrees in the house. They did a good job and had to come in behind someone who hadn’t done such a good job. I understand how difficult that can be. The temperatures now are easily controlled and comfortable,” Miller said. “They did an excellent job,” raved Jane Wild of the work done at her Hilton Head Plantation home. “They were on time, they were very neat, and they did excellent work. I would highly recommend them.” Wild touched on the neatness factor, which was possibly the most commented on feature of the jobs completed. According to Bayer, the crews work very hard to leave each job at least as clean as they found it, if not cleaner. It seems founder John Guffey was on to something. Starting as a highly satisfied customer, he was so intrigued by the product and the personnel of Energy One America that he did some research and decided to step out of retirement and purchase the company. Should Guffey be seated front and center at any performance by his company, he would find himself surrounded by the cheers of his customers giving his team a standing ovation. Energy One America is located at 270 Red Cedar Street, Suite 104, Bluffton. For more information, call (843) 815-9931 or visit online at energyoneamerica.com. You should look up the definition of penultimate before you misuse it again.